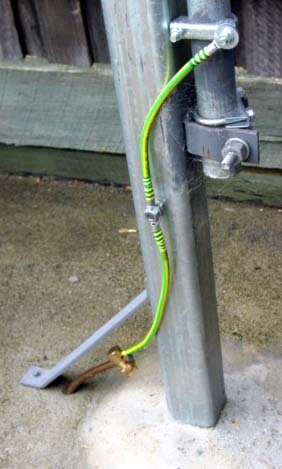 The following article describes an antenna mast for use with experimental VHF / UHF antennas. to have basic protection for lightning. 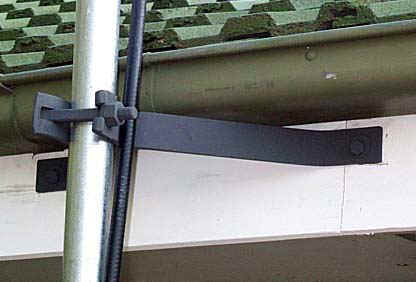 A 9m telescopic TV style mast is supported in scaffold clamps to the rear of the post. The mast is easily extended from its collapsed height of 3.5m to its full height of 9m. The post is 3.6m of 75x75x6mm galvanised RHS mild steel. A 300mm hole was cut in an existing paved area using an electric demolition hammer. The post is set 1.2m in concrete in a 250mm diameter hole in undisturbed ground. The top of the post is closed off with a draining cap fabricated from 3mm mild steel. Guys are provided to support the mast under strong winds, but the guys are not required under light winds conditions. The integrated cleat provides a handy point for securing hauling lines. Cables are routed to a patch panel on the interior wall of the building via a steel duct which provides room for bending the Heliax and weatherproofing for the opening in the brick wall. The wall opening was achieved by removal of a single brick which has been retained undamaged to restore the wall when needed. 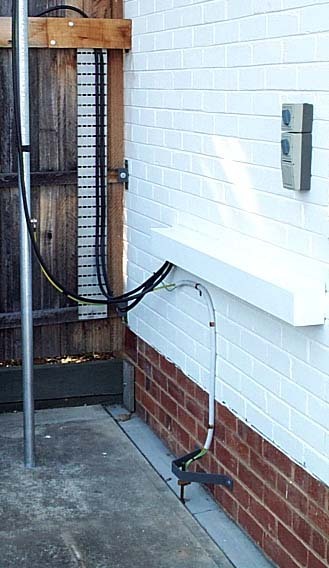 A short length of cable tray fixed to the fence makes for tidy cable management. Lengths of 150x25 mm hardwood are nailed to the fence rails to form a horizontal cable trough. Another mast consisting of a 6m length of 40mm nominal bore (~50mm OD) galvanised pipe seen here carries a VHF / UHF discone. Guys are attached to the mast at 8m above the ground to provide support for strong wind conditions. The lower end here is attached to a cleat fabricated from mild steel with a chain link welded to the end. One of the coach screws pictured here reaches through into the rafter. My calculations on the installation indicate that its wind survival is limited to limited to about 80Kmph without the guys. With guys, the mast should withstand 150Kmph. The guys are 4mm 7x7 G1570 FSWR. Note the eye and eye turnbuckle and that the D shackles and turnbuckles are moused to prevent loosening. This bracket is fabricated from half of an old scaffold swivel clamp welded to a mild steel formed bracket. The bracket is fixed to the roof structure by long coach bolts screwed into the end of the rafters. The lower end of the mast is located over a piece of smaller pipe bolted to the concrete. The pole is earthed via a driven earth electrode. The earth electrode is 2.9m of 12mm copper clad steel electrode. It is bonded to the pole using 25 square mm copper earth conductor which is designed to withstand 10KA for 0.1s. A hole 20mm in diameter was drilled through the existing concrete to accept the electrode and coupler. The electrode was in two pieces with a coupler, and driven in using an electric demolition hammer. A driving adapter was made from a regular bull point which was cut off, annealed and drilled with a blind 15.1 mm hole, then re-tempered. The electrode was driven in less than a minute. Earth resistance by the 3 wire falling potential method (820Hz) at the end of the driest summer in 30 years was 8.6 ohms. Earth resistance is usually around 6 ohms. The cable connection uses a common line tap. The steel strap is to protect the earth electrode and wiring from mechanical damage. The pole is equi-potential bonded to the electrical installation earth. The discone mast and patch panel are earthed via a dedicated driven earth electrode. The earth electrode is 2.4m of 12.7mm copper clad steel earth rod. It is bonded to the pole using 25 square mm copper earth conductor which is designed to withstand 10KA for 0.1s. A hole 20mm in diameter was drilled through the existing concrete to accept the electrode which was driven in using an electric demolition hammer. A driving adapter was made from a regular bull point which was cut off and an adapter fabricated from mild steel. The electrode was driven in less than a minute. 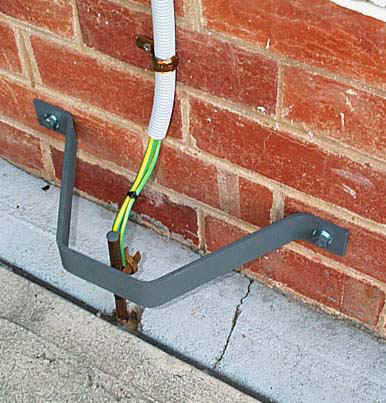 The earth conductors are attached using a medium size line tap which fits over the earth electrode. 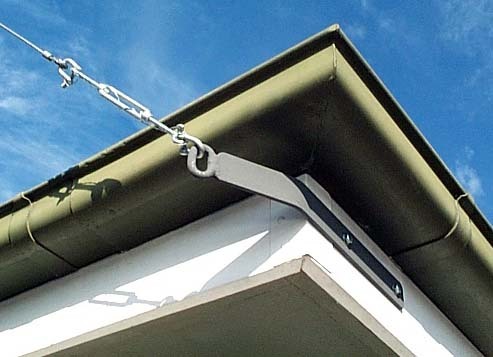 A fabricated mild steel bracket prevents accidental mechanical damage. Earth resistance by the 3 wire falling potential method (820Hz) at the end of the driest summer in 30 years was 16 ohms. Earth resistance is usually around 11 ohms. The mast is equi-potential bonded to the electrical installation earth. The patch panel is a standard SQ series wall plate with four N type bulkhead connectors mounted. Two of the connectors have LDF4-50 cables connected, the other two have RG213/U cables attached. 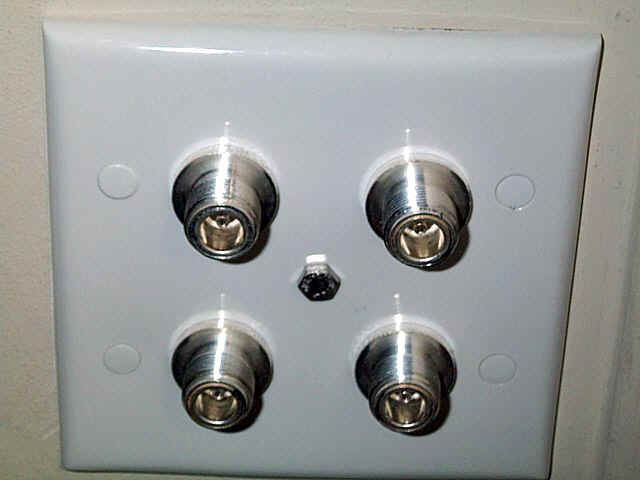 A small aluminium plate was cut to fit behind the plastic plate to bond the coax connectors to an earth cable attached at a small bolt in the centre of the plate.